This summer may prove to be a landmark in Iceland's history as the government and Alcoa, the world's largest aluminum company, negotiate prices and terms for constructing and operating Iceland's largest energy project, the Karahnjukar Hydropower Project. The project, to be situated north of the Vatnajökull Glacier in an area claimed as Europe's second largest wilderness area, is the most recent manifestation of plans that have been debated since the late 1950s to harness the energy of the area's large glacial meltwater rivers. Recent government support has accelerated the process, and the project may soon be a reality. Alcoa has signed a Memorandum of Understanding with the government and Landsvirkjun, the national power company, to pay three-fourths of the cost of road construction across the wilderness, and Landsvirkjun hopes to begin construction before this winter. These developments, along with opposition from environmentalists, have brought the issue to the forefront in Icelandic news. The present project would dam and divert two of the area's largest rivers, the Jökulsá á Brú and the Jökulsá í Fljótsdal, and divert four smaller rivers. The resulting Hálslón reservoir will submerge 57 square kilometers of isolated highland wilderness. Water from the reservoir will be transported through a 40-kilometer-long tunnel over to a powerhouse and from there to the proposed Alcoa aluminum smelter plant in Reyðarfjöður. This smelter will be the sole user of this energy. Map of the proposed Karahnjukar Hydropower Project site. Click on image for detail. Supplied courtesy of Landsvirkjun. Geologically, Iceland is unique, with both frequently active volcanoes and extensive glaciers. Geothermal power generates all household energy which represents 10 percent of the total energy produced in the country. Hydroelectric power accounts for 90 percent of Iceland's supply and is predominant in the industry sector. "It is still not clear whether the planned Karahnjukar dam is really the most cost effective way of providing the power needed for the planned Alcoa smelter," says Olafur S. Andresson, a biochemist at the University of Iceland and a board member of the largest environmental non-governmental organization, Icelandic Nature Conservation Association (INCA), the local partner of the World Wildlife Fund. "It is quite feasible to construct a smaller, lower-impact dam and reservoir and use readily available geothermal power to supply the plant." Siggurdur Arnalds, project manager for the Environmental Impact Assessment report commissioned for the dam and an Honnun Consulting engineer at Landsvirkjun, disagrees. "There is absolutely no intention by Landsvirkjun to make the Karahnjukar Project smaller. Many changes have been made in the past and therefore a considerable amount of energy has already been cut off as environmental compromises. A further reduction would be a waste of our national resources and is not in agreement with the Government." The Environmental Impact Assessment report states that risks from large-scale volcanic hazards and associated seismicity by the building of the dam are considered small as most of the active volcanism is west of the proposed site. The hazards of harnessing glacial rivers are also relatively low in Iceland. Three other power-intensive plants in Iceland tap glacial meltwaters, and the Alcoa aluminum plant will be the fourth, Arnalds says. Guðmundur E. Sigvaldason, past director of the Nordic Volcanological Institute in Reykjavik and geologic advisor to INCA, is more cautious about the geological hazards of the area and the unique interplay of climate, mantle viscosity and crustal deformation in the region. "The observed heavy fracturing of the crust at the dam site combined with ongoing crustal deformation due to fluctuations in glacier loading is a serious matter of concern for the proposed project," Sigvaldason says. He also says that no hazard evaluation has been performed on a nearby volcano that might have adverse effects on the project. The volcano is located in a relatively quiescent part of Iceland, but Sigvaldason contends that the region does not have a well documented dataset of volcanic and seismic activity. Landsvirkjun and the government have countered Sigvaldason's comments on the basis of their research. "There is no doubt that the project leaders are correct when saying that in view of the information they received it is very unlikely that natural events will damage the construction. The question remains if the information received was sufficient and correct," says Sigvaldason. 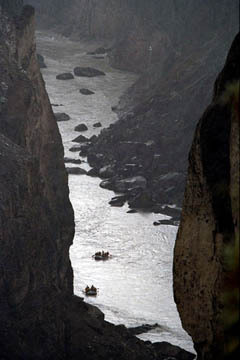 Looking down into the 160-meter-deepDimmugljúfur or the Dark Canyon,carved out by the Jökulsá á Brú river . The canyon will be dammed at its entrance and dry except for the wettest months of the year. Photo supplied courtesy of INCA. The ecological and environmental implications are also controversial. Though not designated as a protected area, except for the reindeer calving grounds at Kringilsárrani, the region is cited for its unique ecology and geology. Some of the most intact examples of Iceland's original vegetation survive here. Dimmugljúfur, the Dark Canyon, a 160-meter-deep canyon carved out by the Jökulsá á Brú is considered one of Iceland's most spectacular. Environmentalists claim that the dam would destroy much of this vegetation and leave the canyon dry. "Below the dams, river flow will greatly decease during the summer time. On the lowlands, the greatest impact will be on Lake Lagarfljót (third largest lake in Iceland) and its biology, mainly wetland areas with rich bird life. Out in the ocean, marine life will be affected along the coast of Héraðsfloi bay," says Hilmar J. Malmquist, freshwater biologist, curator of the Natural History Museum of Kópavogur and INCA board member. Soil erosion, a well known problem in other parts of Iceland, may also be an issue here. Landsvirkjun counters these claims with its own assessments. Despite a history of controversy regarding the environmental soundness of the project, the government vouches for it on the grounds that it will boost the economy of northeast Iceland and keep the locals from migrating to larger urban areas in search of jobs. The dam proposal was rejected by the Iceland Planning Agency in August 2001 of the grounds that the environmental impact information was insufficient. However, in December 2001, after Landsvirkjun provided additional information and modifications to the initial proposal, the environmental minister, Siv Fridleifsdottir, overruled the Iceland Planning Agency rejection of the proposal and reinstated it. This April, the plan faced setbacks when Norsk Hydro, the Norwegian aluminum company originally commissioned as the partner in the project, backed out citing financial concerns. 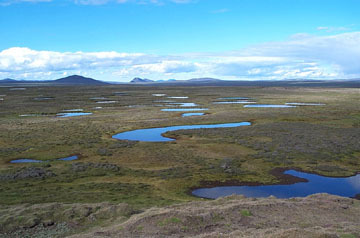 Looking northeast at the wetlands of the Kringilsárrani Nature Reserve. Kringilsarrani isa protected reindeer calving area. Part of Kringilsárrani will be submerged when the Kárahjúkar dam is built. Photo supplied by Guðmundur Páll Ólafsson. Now, with Alcoa as a partner, the government hopes to have the project completed so that at least 600 permanent jobs and many more temporary ones during the construction phase are created. "The gross export values from this project will be the same order of magnitude as the entire foreign income received today in Iceland through tourism, so the economic value and growth for the country is very important," Arnalds says. Environmentalists argue that the project will not boost the Icelandic economy enough, but would instead harm ecotourism. Tourism is presently Iceland's second largest source of revenue. Arnalds contends that this area is not one of Iceland's tourist hotspots. "Due to the high altitude, it is hardly accessible until very late July each year and is generally less visited than other parts of the highlands," he says. In addition, he explains that Landsvirkjun and Alcoa support plans being proposed for a national park at the boundary of the facility and suggests that the infrastructure for the dam will provide accessibility to this park. Depending on who one asks, public popularity for the project varies. "In an opinion poll made by INCA recently, 65 percent of the nation agreed to have a national park where the Karahnjukar project is supposed to be built," Hilmquist says, acknowledging at the same time that Landsvirkjun polls tell a different story. "A new Gallup shows that from those who took a position, 61 percent favor the power plant and 73 percent are in favor of the aluminum plant," Arnalds says. In late August, when road construction is slated to begin, INCA hopes to re-file a lawsuit against the minister of environment to nullify her decision to go ahead with the project. "So there is a good probability that the development will be delayed and modified," Andresson says, indicating that the Karahnjukar project will continue to generate controversy before it receives a clean bill to be built and operate as Iceland's largest source of hydroelectric power.